Get ready to get down, get funky, get loose with Boney M & Liz Mitchell! 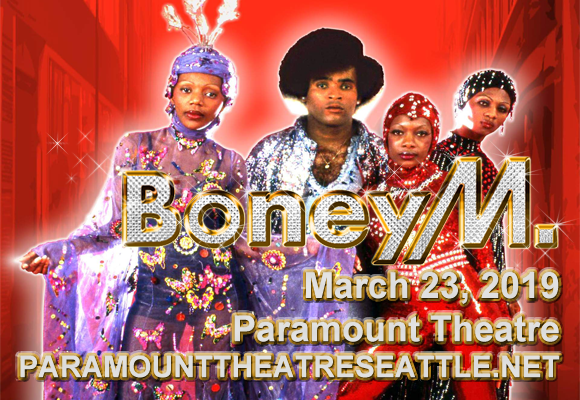 Coming to Paramount Theatre Seattle on Saturday 23rd March 2019, is the full Boney M. experience, fronted by the band's original lead singer, bustin' out all those disco classics like "Daddy Cool", "Rasputin", "Mary's Boy Child – Oh My Lord" and "Rivers of Babylon"! It's time to reinstate those sequin hot-pants and embrace the spirit of disco for one night only! The brainchild of German music producer Frank Farian, Boney M. is an a Euro-Caribbean vocal group best known for its late-1970s disco hits, including "Daddy Cool", "Ma Baker", "Sunny", "Rasputin", "Mary's Boy Child – Oh My Lord" and "Rivers of Babylon". The group was originally formed in 1976 and the members of official line-up were Liz Mitchell and Marcia Barrett from Jamaica, Maizie Williams from Montserrat, and Bobby Farrell from Holland. Over the years, there have been several changes to the group's line-up. Currently, original member Liz Mitchell continues the Boney M. legacy, with the blessing of originator Farian. The original group are the only artists to appear twice in the top eleven best selling singles of all time in the UK, with "Rivers of Babylon" in seventh place and "Mary's Boy Child/Oh My Lord" at number eleven.